A village set on the edge of the cliff, the Castellfollit De La Roca is simply amazing! This is a sight that will make you anticipate it from afar, with a rocky hill of the huge basalt crag featuring quaint, inviting houses. The houses in the municipality here stretch at a distance of some one-odd kilometre. The hill is result of two lavas overlaying each other! The area is characterized with the presence of lots of colourful butterflies. Walking through its narrow, cobbled aisles towards some vantage points is an experience you will cherish forever. Sunny days are the best days to visit this attraction, to enjoy the most of its astounding beauty that adjoins the region. Generally, tourists prefer visiting top attractions of Barcelona like Sagrada Familia, Park Guell, Casa Batllo, Gothic Quarter and Camp Nou. These are few of the top things to do in Barcelona. Insider tips and expert guides will make sure you enjoy the city to its fullest. You can do so by booking any of the Barcelona tours. 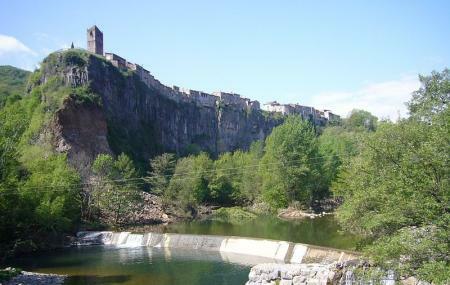 Try the best Barcelona trip planner to visit this Castellfollit De La Roca as well as many others. Hotels like Moderno, Exe Ramblas BoquerÃÃƒÂ­a, Flor Parks and Sant AgustÃÃƒÂ­ will solve your problem of where to stay in Barcelona. Choose from variety of exclusive Barcelona vacation packages for your next visit or create own own. Check out the various options for how to reach Barcelona and finish off your vacation package by booking the ideal transfer. How popular is Castellfollit De La Roca? People normally club together Esglesia De Sant Feliu and Cequin Centre Equestre Quintanes while planning their visit to Castellfollit De La Roca.